In this guide we will show you how to add Login with Amazon to your iOS app, using the Login with Amazon SDK for iOS. After completing this guide you should have a working Login with Amazon button in your app that allows users to login with their Amazon credentials. To learn more about the login flow your customers will experience when they use Login with Amazon within your app, please see our Customer Experience Overview for iOS apps. In order to integrate Login with Amazon with your website or app, you must first sign up. The Login with Amazon SDK for iOS comes in two packages. The first contains the iOS library and supporting documentation. The second contains a sample application that allows a user to log in and view their profile data. 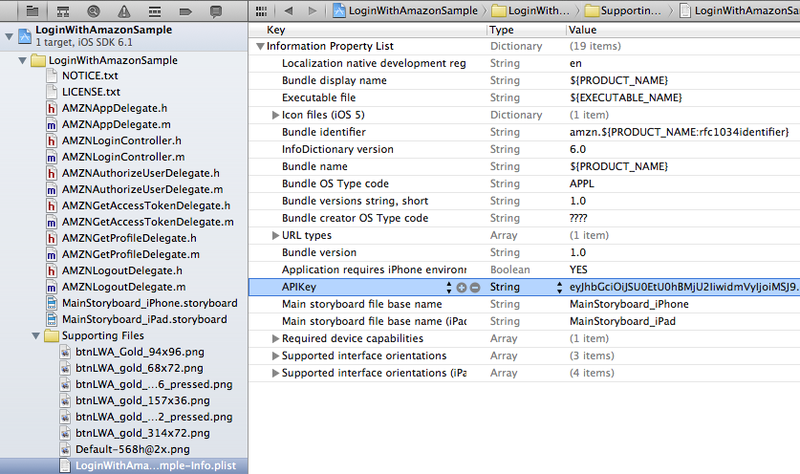 Download LoginWithAmazonSDKForiOS.zip and extract the files to a directory on your hard drive. You should see a LoginWithAmazon.framework directory. This contains the Login with Amazon library. At the top level of the zip is a LoginWithAmazon.docset directory. This contains the API documentation. See Install the Login with Amazon Library for instructions on how to add the library to an iOS project. To run the sample application, open the sample in Xcode. Download SampleLoginWithAmazonAppForiOS.zip and copy the SampleLoginWithAmazonAppForiOS directory to your Documents folder. Start Xcode. If the Welcome to Xcode dialog pops up, click Open Other. Otherwise, from the main menu, click File and select Open. 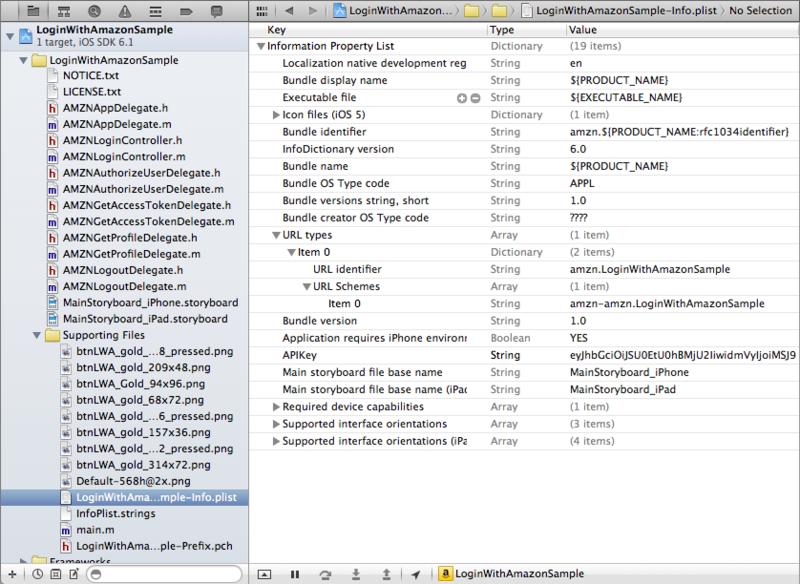 Select the Documents folder, and select SampleLoginWithAmazonAppForiOS/LoginWithAmazonSample/LoginWithAmazonSample.xcodeproj. Click Open. The sample project should now load. When it is finished, choose Product from the main menu and select Run. Note: You will be redirected to Seller Central, which handles application registration for Login with Amazon. If this is your first time using Seller Central, you will be asked to setup a Seller Central account. In the Register Your Application form, enter a Name and a Description for your application. The Name is displayed on the consent screen when users agree to share information with your application. This name applies to Android, iOS, and website versions of your application. The Description helps you differentiate each of your Login with Amazon applications and is not displayed to users. Enter a Privacy Notice URL for your application. If you want to add a Logo Image for your application, click Browse and locate the applicable image. This logo is displayed on the sign-in and consent screen to represent your business or website. The logo will be shrunk to 50 pixels in height if it is taller than 50 pixels; there is no limitation on the width of the logo. After your basic application settings are saved, you can add settings for specific websites and mobile apps that will use this Login with Amazon account. After your basic application settings are saved, you can add settings for specific websites and mobile apps that will use Login with Amazon. From the Application screen, click iOS Settings. If you already have an iOS app registered, look for the Add API Key button in the iOS Settings section. Enter the Label of your iOS App. This does not have to be the official name of your app. It simply identifies this particular iOS app among the apps and websites registered to your Login with Amazon application. Enter your Bundle ID. This must match the bundle identifier of your iOS project. To determine your bundle identifier, select the name of your project in the Project Navigator. The Project Editor will appear in the editor area of the Xcode workspace. Under the General tab, within the Identity section, you can find your Bundle Identifier. If different versions of your app have different bundle IDs, such as for one or more testing versions and a production version, each version requires its own API Key. From the iOS Settings of your app, click the Add API Key button to create additional keys for your app (one per version). The Bundle identifier is unique to every iOS app. 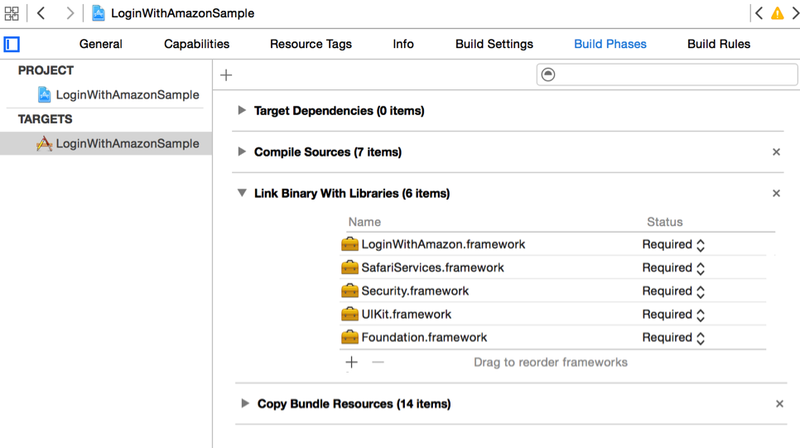 Login with Amazon uses the Bundle ID to construct your API Key. The API Key enables the Login with Amazon authorization service to recognize your app. Open your app project in Xcode. Open the Information Property List for the project (<project>-Info.plist) in the Project Navigator. Find Bundle identifier in the list of properties. After you have registered an iOS version and provided a Bundle ID, you can retrieve the API key from the registration page for your Login with Amazon application. You will need to place that API key into your project's property list. Until you do, the app will not be authorized to communicate with the Login with Amazon authorization service. In the Apps box, click your application. Find your iOS app under the iOS Settings section. If you have not registered an iOS app, see Add iOS Settings to an Application. Click Get API Key Value. A popup window will display your API key. To copy the key, click Select All to select the entire key. Note:The API Key value is based, in part, on the time it is generated. Thus, subsequent API Key value(s) you generate may differ from the original. You can use any of these API Key values in your app as they are all valid. See "Add Your API Key to Your App Property List" under Creating a Login with Amazon Project section for instructions on adding the API key to your iOS app. In this section, you will learn how to create a new Xcode project for Login with Amazon and configure the project. If you do not yet have an app project for using Login with Amazon, follow the instructions below to create one. If you have an existing app, skip to the Install the Login with Amazon Library section below. If you are presented with a Welcome to Xcode dialog, select Create a New Xcode Project. Otherwise, from the File menu, select New and Project. Select the type of project you wish to create and click Next. Enter a Product Name and a Company Identifier. Note your Bundle Identifier, and click Next. Select a location in which to store your project and click Create. You will now have a new project that you can use to call Login with Amazon. If you have not yet downloaded the Login with Amazon SDK for iOS, see Install the Login with Amazon SDK for iOS. A Login with Amazon project must link the LoginWithAmazon.framework and Security.framework libraries. You will also need to configure the framework search path to find the Login with Amazon headers. If your project doesn't have a Frameworks folder, right-click the project name in the Navigator pane in Xcode, then click New Group. Name the new group Frameworks. Select the Frameworks folder and click File from the Main menu. Select Add Files to Project. In the dialog, select LoginWithAmazon.framework and click Add. If you had been using the Login with Amazon 1.0 library, delete the login-with-amazon-sdk directory and login-with-amazon-sdk.a from the Frameworks folder. Click Edit from the main menu and select Delete. Select the name of your project in the Project Navigator. The Project Editor will appear in the editor area of the Xcode workspace. Click your project name under Targets, and select Build Phases. Expand Link Binary with Libraries and click the plus sign to add a library. In the search box, enter Security.framework. Select Security.framework and click Add. In the search box, enter SafariServices.framework. Select SafariServices.framework and click Add. Select Build Settings. Click All to view all settings. 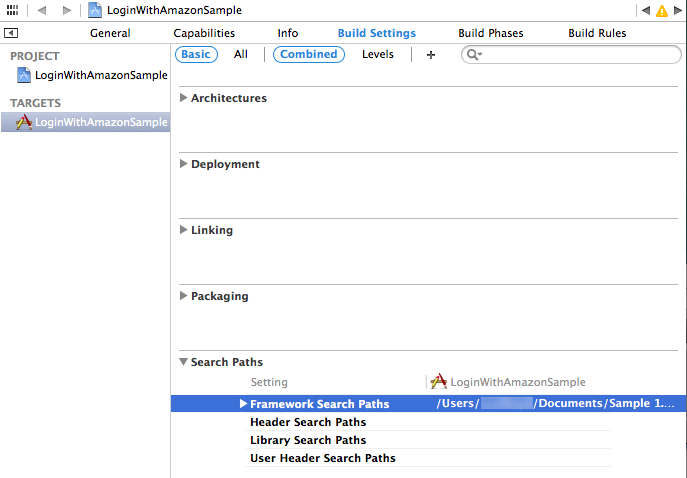 Under Search Paths, ensure that the LoginWithAmazon.framework directory is in the Framework Search Paths. Before building the project, if you used the Login with Amazon 1.0, replace #import "AIMobileLib.h", #import "AIAuthenticationDelegate.h", and #import "AIError.h" in your source files with a single #import <LoginWithAmazon/LoginWithAmazon.h>. The LoginWithAmazon.h line includes all of the Login with Amazon headers at once. Additionally, you can remove any references to the 1.0 library path in the Header Search Paths or Library Search Paths. From the main menu, click Product and select Build. The build should complete successfully. 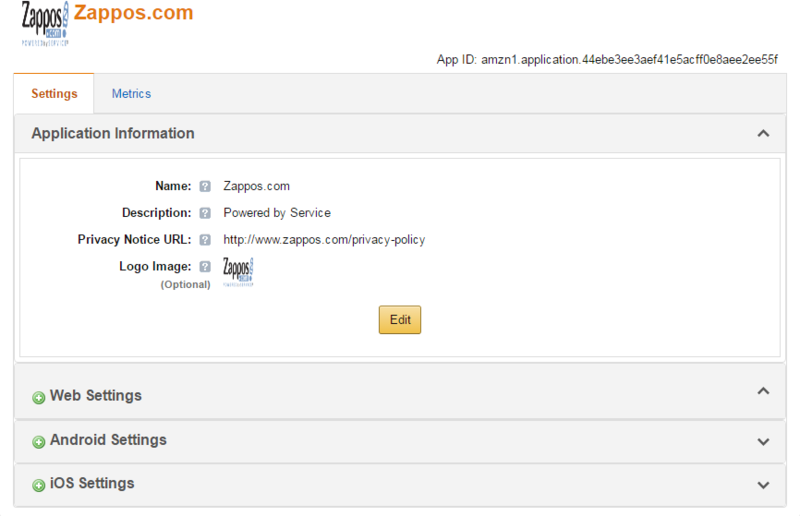 When you register your iOS application with Login with Amazon, you are assigned an API key. This is an identifier that the Amazon Mobile Library will use to identify your application to the Login with Amazon authorization service. The Amazon Mobile Library loads this value at runtime from the APIKey property value in your application's Information Property List. Make sure that none of the entries are selected. Then, from the main menu, click Editor, and Add Item. Enter APIKey and press Enter. Double-click under the Value column to add a value. Paste your API Key as the value. When the user logs in, they will be presented with an Amazon login page. In order for your app to receive confirmation of their login, you must add a URL scheme so that the web page can redirect back to your app. The URL scheme must be declared as amzn-<bundleID> (for example, amzn-com.example.app). For more information, see Using URL Schemes to Communicate with Apps on developer.apple.com. Make sure that none of the entries are selected. Then, from the main menu, click Editor, and Add Item. Enter or select URL types and press Enter. Expand URL types to reveal Item 0. Further expand Item 0 to reveal URL identifier. Select URL identifier and double-click under the Value column to add a value. The value is your bundle ID. You can find your bundle ID listed as Bundle identifier in the property list. Select Item 0 under URL types and, from the main menu, click Editor and Add Item. Enter or select URL Schemes and press Enter. Select Item 0 under URL Schemes and double-click under the Value column to add a value. The value is your bundle ID with amzn- prepended (for example, amzn-com.example.app). You can find your bundle ID listed as Bundle identifier in the property list. Login with Amazon provides several standard buttons you can use to prompt users to log in from your app. This section gives steps for downloading an official Login with Amazon image and pairing it with an iOS UIButton. Add a standard UIButton to your app. For tutorials and information on how to add a button to an app, see Creating and Configuring View Objects and Start Developing iOS Apps Today on developer.apple.com. Add the Touch Up Inside event for the button to a method named onLoginButtonClicked. Leave the implementation blank for now. The Creating and Configuring View Objects and Start Developing iOS Apps Today documents on developer.apple.com include steps on adding a button event. Consult our Login with Amazon Style Guidelines for a list of buttons that you can use in your app. Download a copy of the LWA_for_iOS.zip file. Find your preferred button in both the 1x and 2x directories and extract them from the zip. Extract the _Pressed version of your button if you want to show the button in a Selected state. Add the images to your project. In Xcode, with your project loaded, click File from the main menu and select Add Files to "project". In the dialog, select the button image file(s) that you downloaded and click Add. The buttons should now be in the project under your project directory. Move them to the Supporting Files folder. Add the image to your button. Open the storyboard for your app. Select the button in your storyboard by clicking it or selecting it from the View Controller Scene tree. In the Utilities window, open the Attributes Inspector. At the top of the Attribute Inspector, set the Type of button to System. In the second group of settings, select Default for State Config. In the second group of settings, drop down the Image setting. Select the Login with Amazon button graphic you added to the project. Do not select the 2x version: it will be loaded automatically on high density display (Retina) devices. Set the same image for the Background setting. If you want to specify a pressed version of the button, select Selected for State Config, and set the Image to the _Pressed version of your button. On the storyboard, adjust the size of your button to accommodate the image, if necessary. Implement application:openURL:options: in the class in your project that handles the UIApplicationDelegate protocol. By default, this will be the AppDelegate class. When a user successfully logs into your app using Login with Amazon, they will be redirected from the Amazon login screen back to your app based on the URL Scheme you added to your App Property List earlier. In order to handle this redirect, you must implement the application:openURL:options: method, which returns YES if the URL is successfully handled. The Login with Amazon SDK for iOS provides a library function, handleOpenURL:sourceApplication: which handles any redirect URL sent from Amazon pages. It returns YES if the URL is successfully handled by the SDK. Call this method within the application:openURL:options: method. To invoke this method, you will need to import <LoginWithAmazon/LoginWithAmazon.h>. This section explains how to call the authorize:withHandler: API to login a user. This includes creating an onLoginButtonClicked: listener for your Login with Amazon button. Add Login with Amazon to your iOS project. See Install the Login with Amazon Library under Create a Login with Amazon Project. If you followed the steps in Add a Login with Amazon Button to Your App, you should have an onLoginButtonClicked: method linked to a Login with Amazon button. In that method, call authorize:withHandler: to prompt the user to login and authorize your application. The secure context for the first option is available when the Amazon Shopping app is installed to the device. If the user is already signed in to the Amazon Shopping app, this API will skip the sign in page, leading to a Single Sign-On (SSO) experience. See Customer Experience in iOS apps to learn more. Use the methods defined in AMZNProfileScope to get a scope object and add it to your AMZNAuthorizeRequest object. See the sample code below for details. The second parameter to authorize:withHandler: is AMZNAuthorizationRequestHandler, described in the next step. // Build an authorize request. // Make an Authorize call to the Login with Amazon SDK. // Handle errors from the SDK or authorization server. // Handle errors caused when user cancels login. // Obtain the access token and user profile data. As long as a user is logged in and authorized to your app, you can fetch their user profile data at any time. This section explains how to use the fetch: method of the AMZNUser class to retrieve the most up-to-date user profile data for users who are currently authorized. The profile data you can retrieve is based on the scope indicated in the authorize call. This method will fetch profile data via an AMZNUserFetchRequestHandler block object. The first parameter to AMZNUserRequestHandler is an AMZNUser object. The AMZNUser object can include a userID, name, email, and postalCode, depending on the requested scope. // Error from the SDK, or no user has authorized to the app. If a user logs into your app, closes the app, and restarts the app later, the app is still authorized to retrieve data. The user is not logged out automatically. At startup, you can show the user as logged in if your app is still authorized. This section explains how to use authorize:withHandler: to see if the app is still authorized. Create an AMZNAuthorizeRequest object and specify scopes that indicate the user data your application is requesting authorization for. For more information on scopes, see Handle the Login Button and Get Profile Data above. AMZNInteractiveStrategyAuto (default): The SDK looks for a locally stored authorization grant from previous authorize:withHandler: responses. If one is available, valid, and contains all requested scopes, the SDK will return a successful response via AMZNAuthorizationRequestHandler, and will not prompt the user to login. Otherwise, the user will be prompted to login. AMZNInteractiveStrategyAlways: The SDK will always prompt the user to login regardless of whether they have previously been authorized to use the app. When the user is prompted, the SDK will remove all locally cached authorization grants for the app. AMZNInteractiveStrategyNever: The SDK looks for a locally stored authorization grant from previous authorize:withHandler responses. If one is available, valid, and contains all requested scopes, the SDK will return an AMZNAuthorizeResult object that contains an access token and user profile data. Otherwise, it will return an NSError object via AMZNAuthorizationRequestHandler. // Error from the SDK, indicating the user was not previously authorized to your app for the requested scopes. // The user was previously authorized to your app. This section explains how to use the signOut method to clear the user's authorization data from both the AIMobileLib local data store, and the authorization server. The user will have to login again in order for the app to retrieve profile data. Use this method to log out a user, or to troubleshoot login problems in the app. When a user has successfully logged in, you should provide a logout mechanism so they can clear their profile data and previously authorized scopes. Your mechanism might be a hyperlink, button, or a menu item. Call signOut: in your logout handler to remove a user's authorization data (access tokens, profile) from the local store, and their authentication state from the server. The input parameter to signOut is an AMZNAuthorizationRequestHandler block object. The block should detect and handle NSError objects, which are returned when signOut: fails. // error from the SDK or Login with Amazon authorization server. Launch your app in an iOS device or simulator and confirm you can log in with your Amazon.com credentials. Note: When testing on iOS10 simulators, you may see the error message APIKey for the Application is invalid for an authorizeUserForScopes request, or Unknown Error Code for a clearAuthorizationState request. This is a known bug with Apple which occurs when the SDK tries to access the keychain. Until Apple resolves the bug, you can work around it by enabling Keychain Sharing for your app under the Capabilities tab of your app's target. This bug only impacts simulators. You can test on actual iOS10 devices without using any workaround.